It was all change with the weather again as the temperatures plummeted during the week, we avoided the snow but had a lot of rain although the river was pretty much back to normal level by Sunday. A few of us went to the Little Chef for breakfast again before heading to Upper Coxes to meet the others and do the draw. Rob had been working away and there was a chance he might not be back in time so it was up to me to do the organising although in the end he did make it, even though he was looking a bit bleary eyed! I decided on using the same pegs as last week but would give options for a few of them, with a couple more fishing today I needed to put in a couple more pegs and it was a toss up between Redbridge or 14 and 15, I asked what people would prefer and the general consensus was the latter because it was quite windy and Redbridge can be quite exposed but it was one of those where people were happy for peg 15 to go in the bucket as long as they didn’t draw it! 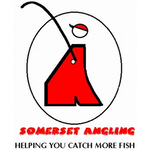 I announced the draw and the usual scrum began, Baz was praying for 128 but drew H4 and had to be happy with that, Adie was on the same peg as last week when he was second with 10lb 9oz, Hurf had the choice of 123 or 124 and wasn’t too happy with either! Rob managed to stay awake long enough to draw and was rewarded with the choice of 124a or 125. 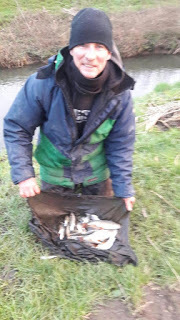 Justin ended up in peg 15 with young Stuart on 14 and his brother Karl on H2, John Dursley was on 126 with Steve P on 129 again although he did have the choice of 129a which just left two pegs for me and Fieldy. 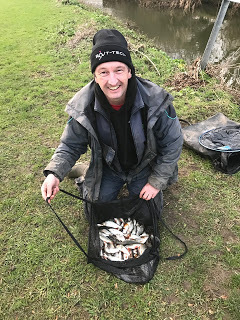 I went first and H1 was my home for the next five hours, a decent peg that should see me get plenty of bites and Fieldy’s drawing hand was still on fire as he managed to pull out last weeks winner! We got to the river and it looked nice with a good pace although, as expected, the colour had pretty much dropped out of it, the pegs above the bridge were quite badly affected by the wind although Karl and myself would be a little more sheltered. I set up a rig to fish three sections to hand and also a 1.5 gram Drennan Carbo with 0.10mm bottom with a size 18 Kamasan B611. On the side tray I had the usual maggots (bronze and red), casters and Bait-Tech Super Seed Hemp. 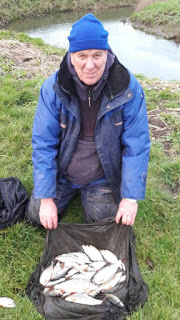 I started with the three sections to hand rig with double red maggot on the hook and was expecting to catch straight away as there are normally loads of small fish in these pegs, after running the rig through three or four times, I hadn’t had an indication, not even a minnow. 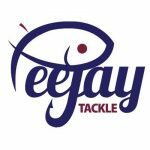 I picked up the heavier rig, shipped out to 8.5 metres and inching the float down the peg, it finally sailed away and I had a small roach, another next chuck and then I had a bleak and I can’t ever recall catching one on the Isle before! My next fish was a tiny gudgeon so I tried caster and started catching roach again but they were on the small side. 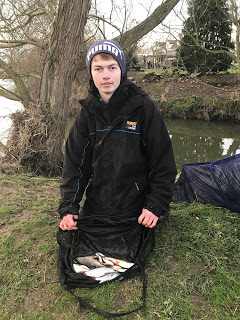 Last week I had ten fish in the first thirty minutes for about 2lb, I had the same number after half an hour again but these wouldn’t go a pound between them! 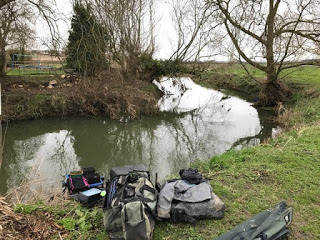 I could see Baz up under the bridge swinging in small fish but Karl hadn’t caught yet, I was feeding to my left and also across towards the cover on the far bank so I added another section and went across to see if I could get some quality fish. More small roach and the odd dace followed but it was a bit of a struggle and at this rate I wouldn’t be putting together a decent weight. 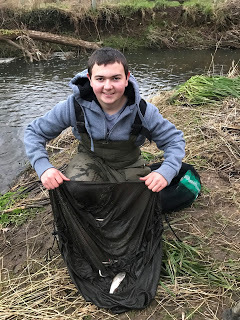 Karl started catching the odd fish and then hooked a better roach only for a jack pike to snaffle it, he had it on for ages before losing it at the net. I shouted down and asked if he could keep all the pike down there thank you very much! I was still getting odd fish including one better roach and I also managed a 6oz perch which pulled out a fair bit of elastic. It just wasn’t really happening and after around three and half hours I was up to 40 fish for about 4lb. I added another section and tried across to the far bank at 11.5 metres to my left where there was a branch in the water, I hadn’t put any feed in there at all, but holding the float back and inching it through, the float went under and I swung in a slightly better roach. 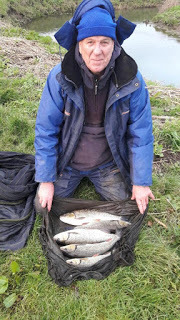 A few more followed including a couple of netters, bites tailed off so I took a section off and fished down the middle to my left and had another decent run of fish but I they were coming in spells. I kept trying down the middle in front on me and across where I’d been feeding but I only had odd fish there all match, back to the left and I hooked a better fish but as I looked behind me to ship back, it went around some reeds on the inside, I could see it was a better roach so after much faffing about I managed to get a decent 8oz roach in the net but the rig was still attached to the reeds and I lost the hooklength. I put another on and then had a funny five minutes where I bumped several fish but the last hour and three quarters were really good and it was a fish a chuck until the end, my clicker was reading 87 fish and I thought I might have 5-6lb but I didn’t think it would anywhere good enough today. I packed up and got the scales from the car, I asked Baz how he’d got on and he said he thought he night have 4lb and that Adie had really struggled. I walked back down to weigh Karl in and he had 2lb 6oz which included some lovely roach, my fish went 8lb 7oz which was more than I thought. We took our kit back to the cars and I walked across the road and leant over the bridge just as Adie weighed Baz in, he had 5lb 6oz and when he said Adie only had 6oz I started to think I might have a chance of sneaking the section, although 129 was in our section today so I’d have to wait and see. Some decent weights again and it was great to see a new peg produce the goods, it does make me wonder how many other pegs/areas are full of fish but it’s always a bit of a gamble putting them in and there have been plenty of times we’ve put great looking swims in, only for people to really struggle.